In August 2012, I was asked if I would like to be the subject of a campaign to promote Pavilions Shopping Centre in Birmingham. Interestingly, instead of using models, Pavilions used “real” women to promote the centre. Having worked as a lawyer prior to becoming a stylist and being a Mum of three children, it was felt that my story would inspire other women. As part of the campaign I styled myself outfits in which I was photographed. 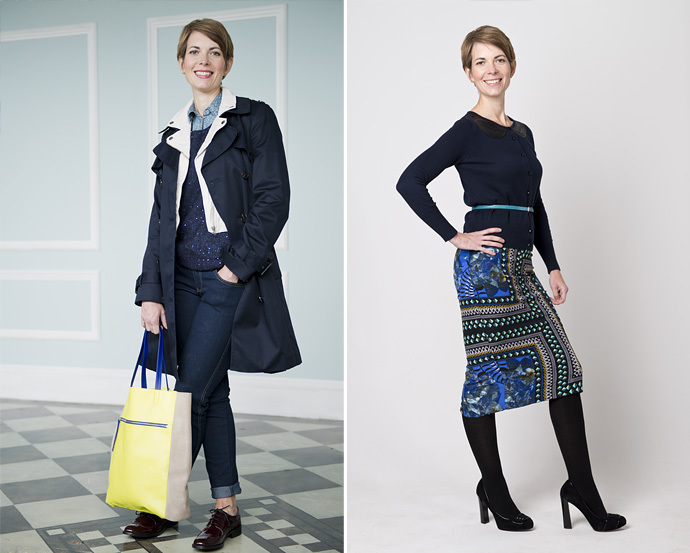 For me it was important to show a whole range of looks – from work outfits to smart/casual outfits, to something to wear on the school run and also for an evening out. I used brands with different price points and didn’t choose anything that I wouldn’t have been happy to wear myself. These images have since appeared in the media to promote the campaign, and interviews and a style event followed. As part of the campaign, I was also asked to film a style vlog – and here you can see the first of its three parts. I hope that you enjoy it, that you find it useful and that you take some styling tips away from it. I feel that in the media, there is a lack of accessible looks for ladies to wear on a daily basis – which is partly why I started my “Style Guile” blog. So, it was only right that I included one very practical, but stylish, look which included some mainstays from our Wardrobes – jeans, a trench coat, brogues, a denim shirt, a knit and a biker jacket. It’s a layered look with texture and interest. I wanted to demonstrate how easy it is to wear a print which can, to start with, look so scary! Provided the rest of your outfit is plain and just one piece takes centre stage, everything falls into place. Wearing prints head to toe is very popular this season – but probably not for the faint hearted! This look featured a dress from NW3 at Hobbs, reflecting the Heritage trend which is so big this season. I loved the print on this dress and also the Peter-Pan collar – which taps into another big trend. The shoes were from M&S.